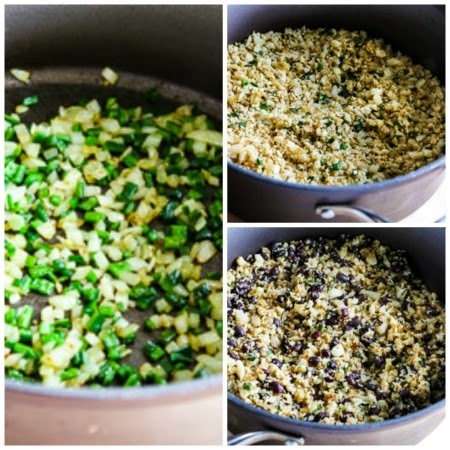 Slow Cooker Green Chile Chicken Cauliflower Rice Burrito Bowl features Slow Cooker Green Chile Chicken made into a burrito bowl with cauliflower rice and black beans. So yummy! And if you skip the black beans it’s delicious for a healthy low-carb dinner. Use the Diet-Type Index to find more recipes like this one. Click here to PIN this Slow Cooker Green Chile Chicken Bowl! Click here to see Instant Pot Low-Carb Green Chile Chicken Burrito Bowl. 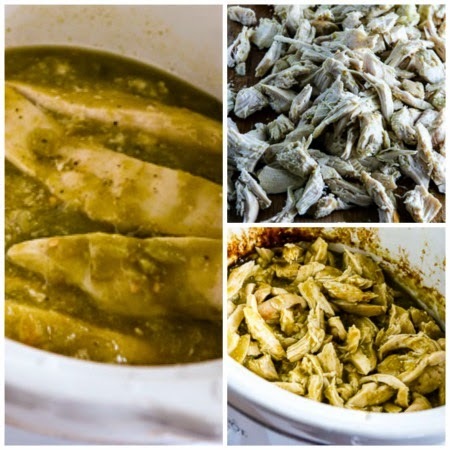 Once you’ve made the slow cooker green chile chicken, you can turn it into Slow Cooker Green Chile Chicken Bowls with Cauliflower Rice (or make Green Chile Chicken Tacos with Poblano-Cabbage Slaw if you prefer.) 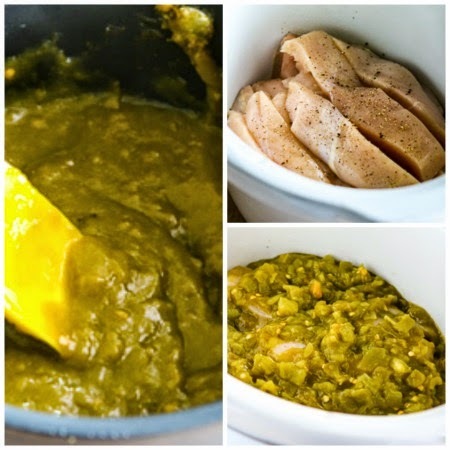 The green chile chicken is ready to come out of the slow cooker after about 3 hours, including the time to reduce the sauce, so this is a meal you can start in the afternoon and enjoy for dinner that night. And if you want to see the lower-carb Instant Pot version of this recipe, check out my Instant Pot Low-Carb Green Chile Chicken Burrito Bowl. Simmer the Hatch Green Chile Enchilada Sauce until it’s reduced to 3/4 cup, about 45 minutes. Trim chicken breasts and cut into strips; then layer the chicken strips in the slow cooker. Pour over the reduced sauce (and a small can of diced green chiles if you want more heat.) Cook in high for about 2 hours. When the chicken is done and shreds apart easily, remove chicken and shred apart (leaving the sauce in the slow cooker.) Put the chicken back in the sauce with the slow cooker on low to keep warm while you make the cauliflower rice. 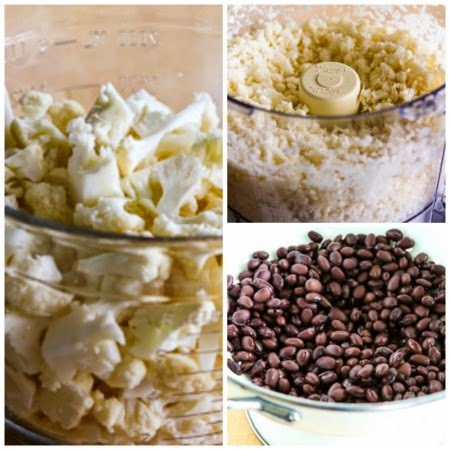 Chop up about 6 cups cauliflower (one large head) and buzz it in the food processor until it’s mostly chopped into small pieces resembling rice. Rinse a can of black beans and let them drain well. Saute chopped onion and chopped Poblano chile pepper with a little ground cumin. Add the chopped cauliflower “rice” and saute about 5 minutes. Stir in the black beans and a little lime juice and cook until the beans are heated through. 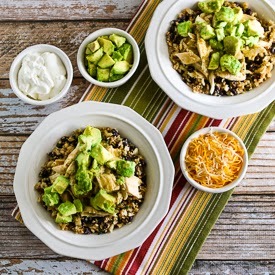 Put rice mixture in a bowl, top with green chile chicken and garnish with avocado, sour cream, or cheese as desired! Slow Cooker Green Chile Chicken made into a burrito bowl with cauliflower rice and black beans is so yummy! Put green chile enchilada sauce into a small non-stick saucepan and simmer over medium-low or low heat until the sauce is reduced to 3/4 cup, about 45 minutes. While the sauce simmers trim all visible fat and undesirable parts from the chicken breasts, and cut each piece of chicken lengthwise into thirds. Cook on high for 2 hours, or until the chicken is done and shreds apart easily with a fork. Chop the onion and the Poblano chile pepper. When the chicken is done, remove it to a cutting board, leaving the sauce in the slow cooker. Shred chicken apart with a fork and put it back into the slow cook, stir to coat the chicken with sauce, and turn the slow cooker to low to keep the chicken warm while you cook the other ingredients. Heat the olive oil in a large non-stick frying pan over medium-high heat. Add the chopped onion and finely diced Poblano chile and saute until they start to barely brown, about 3-4 minutes. Add ground cumin and cook about 30 seconds, then add the chopped cauliflower and cook, stirring often, until cauliflower is cooked through and barely starting to brown. I cooked the cauliflower almost 5 minutes, but you may prefer it more well done, so taste a few times. Season cooked cauliflower rice to taste with salt and fresh-ground black pepper. Stir in the drained black beans and lime juice and cook a minute or two more, until the beans are heated through. To serve, make a layer of cauliflower rice/black bean mixture in the bottom of a flat bowl. Put a few spoonfuls of green chile chicken over the rice and garnish with chopped avocado, grated cheese, sour cream, and salsa as desired. for this recipe, but any slow cooker that’s 3-4 quarts will work. For this recipe I used Hatch Green Chile Enchilada Sauce, and my fresh-frozen lime juice. This Slow Cooker Green Chile Chicken Burrito Bowl uses lots of healthy low-glycemic and low-carb ingredients like chicken, cauliflower, beans, and chiles. The Hatch Green Chile Enchilada Sauce does have some carbs, but divided among 6 servings, it adds less than 5 carbs per serving, and I’d eat this dish for any phase of the South Beach Diet or for a carb-conscious eating plan. If you prefer a lower-carb meal, just omit the black beans from the rice mixture. Use the Diet Type photo index pages to find more recipes suitable for a specific eating plan. You might also like to Follow Kalyn’s Kitchen on Pinterest to see all the good recipes I’m sharing there. Click here for more Slow Cooker / Pressure Cooker Recipes on my other site! I love this recipe. It is super easy for weekdays, I love the gf option, and the flavors and textures all go well together. I was skeptical about how filling cauliflower rice could be, but I definitely felt full afterwards. Hi Amber, so glad you enjoyed it! I've gotta try the hatch enchilada sauce. Hopefully I can find some in Atlanta. I love everything about this recipe, Kalyn! Bill, I really hope you can find it! Kalyn why are you cooking and eating gluten free (forgive me if you have already explained and I missed it). What does gluten do? I am not gluten-intolerant, but I do try to avoid flour so for that reason a lot of recipes I cook are gluten-free. I try to make my recipes work for as many people as possible, and for people who have Celiac Disease, even a small bit of gluten can make them sick for days. So for that reason (and since many of my recipes are naturally gluten-free due to the lack of flour) I try to spotlight it when a recipe is or can be gluten-free. Oh my goodness, this recipe looks and sounds amazing, Kalyn! So glad you mentioned the gluten-free factor for enchilada sauce, too. So many luten-free individuals don't think about the sauce possibly containing gluten and then learn the hard way that many are not gluten free. Off to share this recipe! Thanks Shirley. I have been so happy with the Hatch Gluten Free Enchilada sauce! I know I should give cauliflower rice a chance, but I just haven't worked myself up to it yet. However, the flavors in this rice bowl dish are so enticing that I might have to make cauliflower rice for the first time! Lydia, I think adding the onion and Poblano chile really makes the cauliflower rice a lot more flavorful. But you can definitely eat this over regular rice too!